Welcome to Gold Rush Cheer! 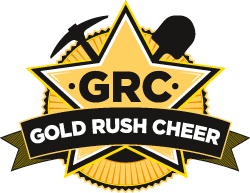 Welcome to Gold Rush Cheer, we are the only regional community based program that specialises in the amazing athletic sport of all star cheerleading! Our programs cater for all ages from 2 years old to adults offering performances at community events, team bonding activities and selected teams travelling for state and national competitions. Gold Rush Cheer boasts a fun and positive environment for athletes not only to learn great athletic skills but strive to develop life skills to be proud of, such as team work, determination, willingness to learn spirit on and off the floor, including everyone, being kind, friendly helpful athletes that we are proud of! Our Mission at GOLD RUSH CHEER is to help every athlete have fun, work hard to reach not only their goals but the squads goals too, make friends and build self-confidence. Ensuring this in a positive safe working environment, learning new skills and growing to your full potential! We look forward to welcoming you into our gym and become part of the Gold Rush Cheer family! The coaches and athletes at GRC are amazing. Everyone is so supportive of each other no matter what skill level you’re at, and GRC really is a big family. 100% recommend for anyone wanting to try cheer in the Goldfields, especially if you want the opportunity to travel and compete. My daughter started at GRC this year & I’ve seen her grow in confidence & skill. Thank you to all the team especially Jess & Allison.